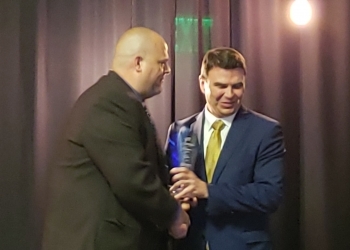 Bartlesville’s Tri-County Tech was named the Business of the Year at Tuesday night’s Bartlesville Regional Chamber of Commerce Annual Gala. The event saw the graduation of the 2018 Leadership Bartlesville class and Chamber Board Chairman, Brian Lawrence turned the position over to 2019 board chairman, Nathan Barham. Emily Allen Worrell received the Rising Star Award. Christie Conditt was named the winner of the Jake Bartles Award. Retired Executive Director and Founder of Mary Martha Outreach, Jamie Wood received the Ernie McAnaw Award. The Tom Shumake award went to Bartlesville School Superintendent, Chuck McCauley. Deb Cook walked away with the Jim Gillie Outstanding Citizen Award. Retired Central Middle School Principal and State Representative, Earl Sears is the recipient of the Frank Phillips Award, and Carmen Stanton of Career Employment received the Small Business Award. The Chamber celebrated 114 years of service, advocating for Bartlesville’s business community and fulfilling its mission as a leading force for business and success and community development.